Jim Patterson is the goals King of Queens with a record 251 strikes for the club. In a long and distinguished career at Palmerston, Patterson gained international recognition in 1953 with a game for Scotland against The Army. Patterson was born on 17 August 1928 in the village of Luncarty in Perthshire (Perth is four miles South of Luncarty along the A9). He excelled at sport at school and then trained as a motor mechanic before his national service. He was playing for his local club Luncarty Juniors with his fine performances catching the attention of on lookers. One of these was scouting for Queen of the South, who, rather than move for the big, stocky forward, were waiting for his demob from the army. This nearly cost Queens dear. Patterson was invited to spend a weekend with Manchester City for a trial and look around. Ex-Queen of the South player Jackie Oakes was at City at the time. Oakes made arrangements for Patterson’s accommodation in anticipation of Patterson inking the dotted line. However Patterson had a change of heart and returned to Scotland. Queens moved in to sign him from under the nose of Rangers. "Jim Patterson, a great guy Jim, he signed from Luncarty Juniors up in Perth. He was so strong, it was like running into a tree trunk, he was a well built fellow and he could withstand all these knocks and what not, and he also had the ability to score all those goals that he did. Quite phenomenal, quite phenomenal. A great guy Jim." 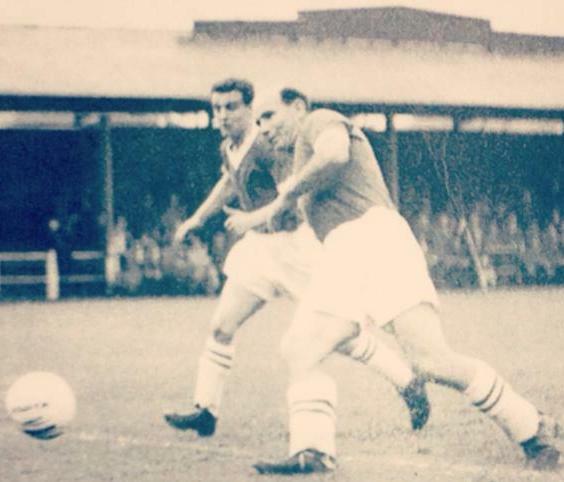 Patterson was signed by Queens Manager Jimmy McKinnell Jnr in 1949. "Big Jim" as he was known, as per Brown’s comments was an unassuming player of few words, preferring to let his boots do the talking. Big, strong, powerful, committed and fearless, he had a thunderous shot and thumping heading ability. The bustling Patterson always gave 100% regardless of wherever on the park he was asked to play. 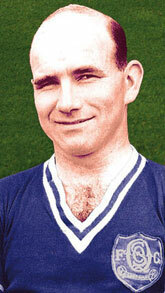 He joined a Queen of the South who had been in the top division of Scottish football since 1933, and initially played up front wearing the number eight jersey beside centre forward Billy Houliston. 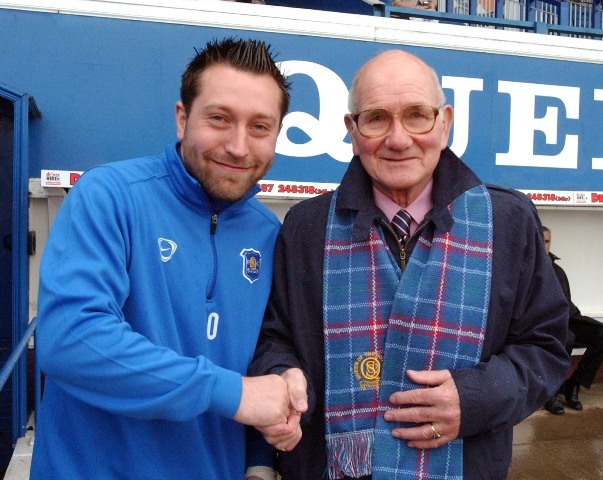 Patterson made his Queens debut against Dundee at Palmerston on 12 November 1949. Patterson’s first season at the club saw the disappointment of the top division run coming to an end. On the plus side there was the landmark Scottish Cup run to the semi final. The similarities to the 2007/08 cup run are uncanny; A first tie away in the North of Scotland (in Patterson’s case it was in Inverness against Caledonian before contests against three teams Queens would play in the 2007-08 contest; in the first of these Queens seen off Morton. Queens then went into previously uncharted Doonhamer territory after a goal fest against Aberdeen gave a first ever Scottish Cup semi final place. Charlie Brown again. "Although we hadn`t done well in the League, the Scottish Cup was a different story! In the first round we beat Inverness Caley 1-0 away from home [Patterson scored] and in the next round we drew 1-1 with Morton at Palmerston. Nobody gave us much chance for the replay at Cappielow but we went up there to Greenock and beat them 3-0 and I grabbed the third goal [Patterson scored the second]." "Jim was exceptionally quiet. We had that week when we played here and in Aberdeen in the cup. Aberdeen were 3-0 up at half time and it finished three all. We then had to play them up there on the Wednesday in the replay of the cup. And we also had to play them on the Saturday in the league. So we left here on the Sunday and we stayed up there for a week. We had quite a nice time up there, it was really good and of course we had two wins. When we played up at Aberdeen, Jim and I roomed in the hotel. I hardly knew the guy at the time, I’d only seen him for a few games earlier on in the season. ’Good morning Charlie’, ’Good night Charlie’, was all he said and that went on for 7 days." Queens then ultimately went down in the semi despite a commended display against Rangers. Despite being played outside the top division the 1950/51 season has to be looked upon as a huge success. It was the season that saw a return to some of the great days of the 1930s. The team that was coming together would prove itself over the next few years to be the finest in the history of the club to date. Queens climbed back to the top flight at the first attempt as Scottish B Division champions. Queens also made a first appearance in the semi final of the Scottish League Cup. Queens took the lead against Hibs through a Charlie Johnstone screamer in front of over 32000 fans at supposedly neutral Tynecastle. In a keenly contested game Queens eventually went down 3-1 to an Eddie Turnbull hat trick. While Hibs lost the final they went on win the league in emphatic and blistering style as easily Scotland’s best team. In the championship campaign Patterson started Queens off on the right foot with the only goal in the league opener away to Kilmarnock. Patterson then scored both in a 5-2 defeat by a Stirling Albion side who would be run away league leaders. After the 4th league game of the season Patterson was already on six goals. However Queens early season league form was inconsistent. The table on the evening of January 6th showed unbeaten Stirling impressively on played 19, points 36. In the era of two points for a win Queens were way back in 6th place having played 15, points 17. However that afternoon’s 2-1 home win against St Johnstone marked the beginning of the lean mean Queens machine. It was also the day of the last game of Stirling’s unbeaten league form. Patterson was among the scorers in the next game, late goals giving a 5-1 win over Alloa. In a 3-0 home win against Dunfermline, Patterson opened the scoring with a 35 yarder. Patterson was on the score sheet again in the 3-3 home draw against Dundee United and also hit a double in the 3-1 fight back away against Cowdenbeath. With Queens continuing to win and Stirling dropping points the promotion battle was warming up nicely. The March visit of promotion rivals Ayr United had become a four pointer. In front of a 14000 crowd Patterson put Queens on the way to a 2-1 win in gymnastic style with an over head kick. Patterson then scored again as Queens came from behind to win 3-1 at Arbroath. With Patterson and Billy Houliston setting about the Stenhousemuir defence (Houliston in particular making his opponents need stress therapy with a fine game), the 5-2 win saw Queens have an excellent day at the office – promotion rivals Dundee United, St Johnstone and Ayr all dropped points. Six games to go. Next another four pointer in an away trip to ‘St John’s Toun of Perth’. Jimmy Inglis ruthlessly cracked in four. Final score St Johnstone 0, Queen of the South 6. Queens were now in second place – nine points behind Stirling but with 4 games in hand and a top of the table clash at Palmerston to come. The title chase was becoming a boiling pot. After a 3-1 win at Stenhousemuir the next game was Albion Rovers at Coatbridge. He did travel by the railway line (doors and windows open wide sadly appears to be undocumented). In Glasgow Patterson was given wrong train information and found himself on a train to Shotts. After returning to Glasgow only a taxi to Cliftonhill allowed Patterson to arrive in time for kick off. Queens secured another majestic victory with Houliston again the master of mayhem to the opposing defence - Houliston hit a hat trick in a 4-1 win to secure promotion. And so the top of the table shoot out - a hard fought pressure cooker encounter unsurprisingly decided by the only goal of the game. Final score Queens 1, Stirling 0. The name on the score sheet – Jim Patterson in 37 minutes. With Stirling’s fixtures now complete, Queens were three points behind with only two rearranged games remaining. First a visit to Hamilton and 0-0 draw meaning a last game Queens win would only equal the Stirling points tally. As would happen 51 years later with the John Connolly side, Queens set off looking to secure the ‘B’ division championship (as it was then called) at Station Park in Forfar. Goals from Doug McAvoy and another in an excellent season from Charlie Johnstone indeed saw Queens equal Stirling on 45 points. Thus it was down to goal average. The hard stats read - Stirling 1.77, Queens 1.97. 1 new bottle of Brasso please for the Palmerston trophy cabinet. In the greatest comeback since Lazarus, divisional champions Queens hadn’t lost a league game in 1951. In stunning form since New Year, Queen racked up 14 wins and two draws. At 1 am the sleepy players arrived back at Dumfries station. With awaiting scenes reminiscent of the 1923/24 Scottish Qualifying Cup win, the heroes of the hour were given a less than delicate awakening. The packed throngs at the station determined to celebrate with a cacophony that could be heard in the far reaches of the solar system; a noise generated using anything from rattles and bells to cooking equipment. In one game in 1951-52 Patterson outshone reigning champions Hibs’ ‘famous five’ forward line. Patterson hit 4 goals in Queens’ 5-2 win although Hibs cruised on to retain the title. After Houliston’s departure from the club Patterson was played in the centre of the front five of Bobby Black, Jimmy McGill, Jim Patterson, Wattie Rothera and Jackie Oakes; regarded by many as Queens greatest ever front five, justifiably guaranteed to make older Queens fans reach for the hankies in uncontrollable misty eyed nostalgia. This Queens team were a match for anyone on their day for their first five seasons back in the top flight. In 52-53 Patterson scored another goal with landmark consequences. His goal in the 1-0 defeat of Dundee put Queens into the 10th place where they finished in Scotland’s top league for the second season running. Jim Patterson’s scoring exploits were honoured with one game for Scotland, when he led the Scottish attack v The Army in 1953 at Hampden Park. Like Roy Henderson, Patterson can consider himself unlucky to have played his best years at a time when there was high quality competition for his position in abundance. For example in Patterson’s case Lawrie Reilly notched a highly creditable 22 goals in his 38 games for Scotland. In 1956 again Jim Patterson was a vital cog in the Queens machine. With Patterson top scorer for the season the side emulated the team of 1938/39 by hitting top spot in the league before finishing a still highly creditable sixth – a finish only surpassed by the team of 1933/34. When later asked what was his favourite goal, Patterson was too modest to choose one of his own. He instead mentioned a Wattie Rothera goal from a home league game against Hearts on 15th October 1955. "We were 3-1 down at half time then a young player called Alastair Gibson got one back for us. Then, Freddy Glidden handled in the box and although the Hearts players did their best to put me off, I scored from the spot. In the last minute Wattie got the ball and ambled forward to crack the winner past the keeper and the crowd went wild." Rothera had also scored in the 25th minute to make it 1-1 at that point in the game. Despite the team then passing its peak, Patterson’s goals continued. For example in 1957-58 Patterson twice hit Scottish Cup quarter final equalisers for Queens before opponents Rangers fourth goal of the game took them through (Bobby Black had scored Queens first of the day to start a fight back). Notable late season Patterson goals came with one in the 2-1 win at Easter Road, one in a yet another victory against Celtic (4-3) and a hat trick against Aberdeen (also a 4-3 Queens win). Queens were subsequently relegated from the top division in 1959. With Patterson still finding the net he went on to play with more of Queens’ finest players as part of the early 60s side. Ex England internationalist, Ivor Broadis, joined Queens for the promotion battle. Patterson played in the 7-1 Boxing Day win against Queens Park in 1959. Broadis scored four. Alex Ferguson was the Queens Park scorer. In 1960 ex Scotland and ex Blackpool FA Cup winning goalkeeper George Farm signed for Queens. Queens made the League Cup semi final in 1960/61 for the second and to date last time. With McKinnell stepping aside, Farm was made player manager in 1961 and with Jim Patterson still playing (Patterson was the last of the Queens legends from the early 50s still in the QoS first team), Queens were promoted back to the top division in 1962. Patterson had new Queens legends for team mates in the team of Neil Martin, Iain McChesney and Jim Kerr. In one game in the promotion campaign away to Montrose, Patterson returned to his transportation difficulties of years before but this time missed the first 12 minutes of the game. His 10 team mates were already a goal down when he entered the stage. However Patterson inspired a late fight back with an 82nd minute equaliser. Martin then scored the winner with a couple of minutes to play. McChesney said this of Patterson, "He could play and he was as steady as. Queens’ record scorer, I can remember one game against Cowdenbeath, he scored six [in a 7-1 victory on 16th December 1961]. At the end of his career he actually played centre half a couple of times. Big Jim was a true gentleman. I don’t think I saw him deliberately foul anybody. Sometimes in games you can get a wee bit involved and think, ‘I’ll get in touch with him’. Jim was always that quiet, he just got on and did his job. He was a perfect gentleman, he’s still exactly the same to this day." Patterson finished at Queens playing a last season of top division football in which Queens retained their place in the top flight. There was still time for one last titanic cup tie, a quarter final contest against Dundee United. Patterson’s pass to Willie McLean led to a cross and a Martin headed goal to equalise for a 1-1 draw. In the home replay Queens had to equalise again to stay in the contest. Ernie Hannigan beat his man and from his cross Anderson finished. In the second replay played at neutral Ibrox the sides went in 0-0 at half time before the roof fell in on Queens – they lost 4-0. Patterson must be considered as something of a cup talisman for Queens. Of Queens 13 appearances to date in the Scottish Quarter finals, five were in Patterson’s 14 seasons at Palmerston. Patterson featured in one of Queens’ two Scottish Cup semi final appearances. Both of Queens’ appearances in the League Cup semi finals were in Patterson’s era. Jim Patterson’s last game for Queens was at Shawfield against Clyde on 4th May 1963. Having married in 1957 and firmly settled in the area, he continued to work as a storemen for a further 30 years at Uniroyal in Heathhall near to where he lived. He retained his passion for sport by being a member of not one but of two golf clubs (a pint and a chip roll with his grandsons to finish off 18 holes on the course). Also its only been since later years that he hasn’t remained a regular attendee at Palmerston in the role of supporter rather than striker. 251 strikes for the club make Jim Patterson the undisputable all time goals King of Queens. To bench mark his goal scoring feats in the royal blue this is more than Queens second and third highest all time scorers combined (Bobby Black hit 120 goals from the wing and Andy Thomson notched 114 goals in his two spells). Patterson made 462 league and cup appearances in 14 years with Queens, the third most appearances in Queens history behind Allan Ball and Iain McChesney. The beginnings of young McChesney’s career overlapped with the veteran Patterson. All the more remarkable of the man for his achievements as a Palmerston colossus is his character. Modesty goes to a new level when associated with Jim Patterson. The example above when he nominated a Wattie Rothera goal in preference to any of his 251 was typical of him. A quiet and unassuming man never to speak unnecessarily despite having a dry wit to accompany his warm smile, Patterson would always prefer others to take the spotlight. Like all the profiles in this section this article does not give true testament to the achievements of the player in question. Successful football is built from a successful team. Because it’s a team game, many Queens legends’ greatest moments are team successes listed in profiles of others players from the same era. With Jim Patterson having been a key player and a great player through the finest decade of the club and beyond, this overlap will apply more to Patterson than to most. Queens other finest achievements with Jim Patterson playing are listed in the Queens Legends profile of his team mates, Billy Houliston, Jimmy Binning and Dougie Sharpe. Two post scripts to the above article. Firstly Patterson was among the five initial inductees to the QoS Hall of Fame attending the dinner himself on 29 October 2011 and given a standing ovation. Secondly it was with sadness on Monday 17th December 2012 that the club reported that Jim passed away over the weekend. He was 84.